This 1915 Mabie Todd Swan Trench Pen in #2 size (pen #178) is an eyedropper-filled pen in simple black chased hard rubber. When WWI started, soldiers were sent into battle and the pen industry filled the demand for fountain pens that could be used in the trenches. Parker was first to introduce the Trench Pen, but Mabie Todd & Co. followed not long after. The Trench Pen had a compartment in the barrel designed to hold ink pellets. When needed, the pellets are mixed with water right in the barrel to produce ink. 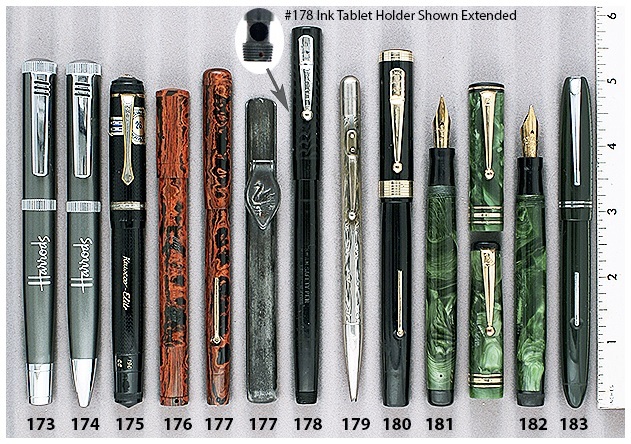 Pen #178 below depicts Mabie Todd’s design – a pellet compartment with a turning blind cap. This design was very useful during the war, when soldiers could not carry ink bottles with them. A very rare vintage pen!